It has been busy for Roanoke firefighters recently. After the funerals for Chris Brown, Warren Hawley, and Stick Walters, firefighters found themselves settling back into the grind. Cluster meetings….they should really rename those! C-shifts last day was a fun one! Captain Wines writes about Todd “multi-media” Harris on Engine 9 blog! Needless to say that no one likes an open mic! We tested the hose on Engine 13 and had help from Engine 9 and Engine 2 packing it back on the truck. The process took most of the day while running calls in between. In the middle of the day we ran a call for a vehicle vs. building! This time the vehicle won. 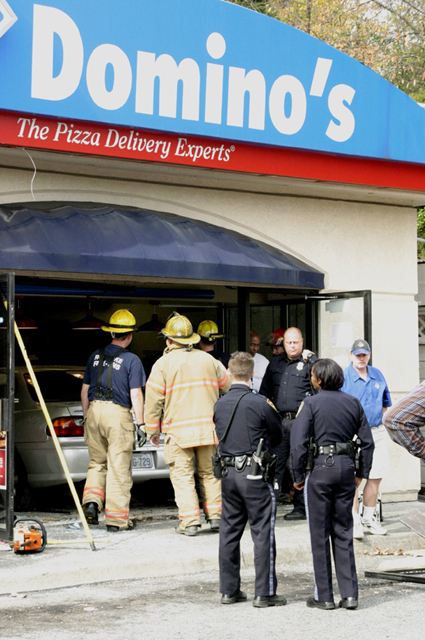 Someone decided to turn Domino’s pizza into a drive thru! Thanks to Engine 5 and Medic 2 for the assistance. A little bit different outcome than when the car lost when it ran into station 1 here. All of the fun ended with a Haz Mat response to Lexington for a fuel spill. There is nothing quite like transferring to another station at 1am to fill in! No big deal though….